Restaurant serves dishes from Russia Kazakhstan and neighbouring regions. ASTANA Restaurant serves up a feast of exotic European fare rarely found here. The dishes from Uzbekistan, Kazakhstan, Russia, Hungary and Ukraine are prepared by Alisher Sarsenbayev, a chef with 30 years’ experience. Daniyar Yunusmetovm, co-owner of the family-run restaurant, recommended that we start with an unusual meat platter that consisted of cold cuts of beef, cow’s tongue and kazi, or preserved horse meat imported from Kazakhstan. Kazi is prepared very much like salami, and is a salty dry meat common to Kazakh and Uzbek cuisine. “Horse meat is popular because of the nomadic background of tribes in these areas,” said Yunusmetovm. One of the more common dishes is Ukrainian or Central European Borsch, a thin broth-like soup with earthy-tasting beetroot that gave the soup its beautiful fuchsia shade. The soup went well with sour cream, which slightly thickened the broth, adding a different dimension to the taste and texture. Other dishes included pelmeni, minced beef dumplings that are wrapped in thin unleavened dough which can be compared to a slightly peppery wonton, and Uighur Lagman, hand-stretched noodles with a sour and spiced soup that tastes of sweetly roasted bell peppers. 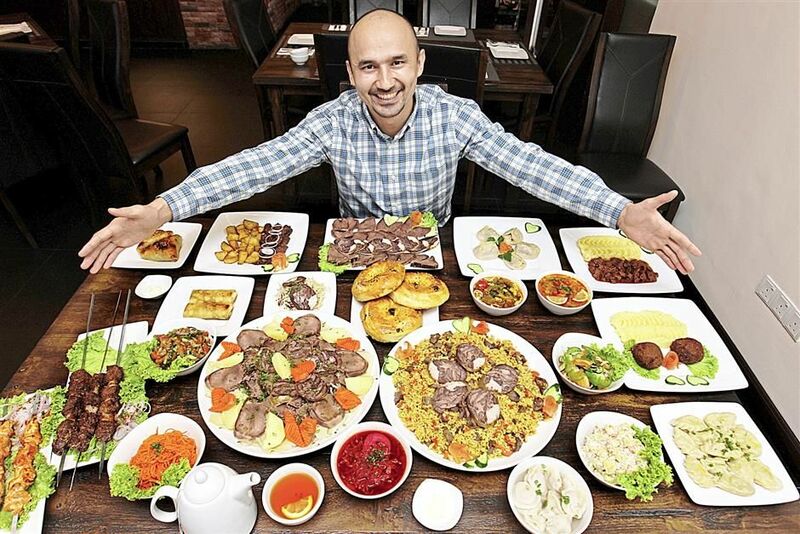 Astana Restaurant owner Daniyar Yunusmetov with a spread of tantalising and unusual dishes from Eastern Europe. Astana also prepared an interestingly traditional dish called beshbarmark. Usually cooked for special occasions, it is served with home-made flat pasta, various spices, tender cow’s tongue, beef and horse meat, while the appetisingly light sauce is made from horse meat broth. Plov, otherwise known as pilaf, is a flavourful rice dish layered with cumin, beef and carrots. There are also rich homemade cakes such as Spartak, named after Spartacus, that has crispy, hazelnut wafer-like chocolate layers, baked separately from chocolate dough and covered in icing. Another dessert known as Black Cake is baked using condensed milk that hardens to create the consistency of caramel for a heavy, yet extremely moist chocolate dessert. 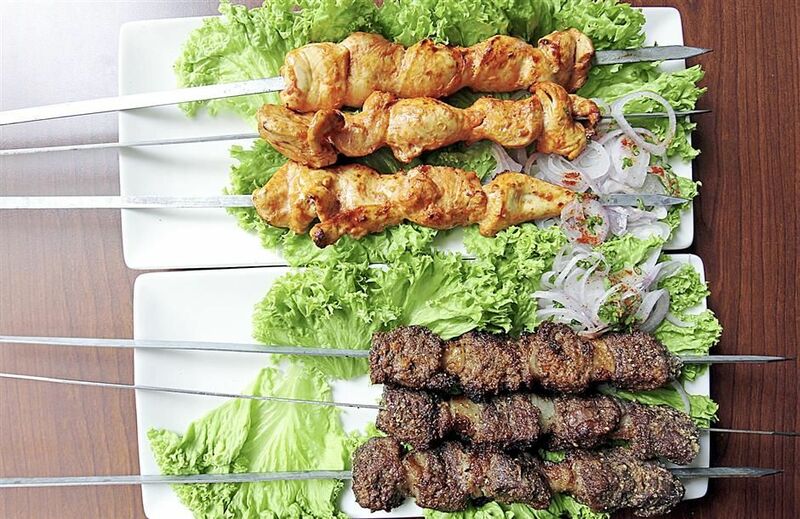 Other dishes served include Beef or Chicken Shashlik, a type of kebab popular throughout the former Soviet Union, Goulash, a stewed beef Hungarian dish, as well as Russian and Ukrainian potato dumplings known as Vareniki. The restaurant serves full and half portions and also provides take-away services.